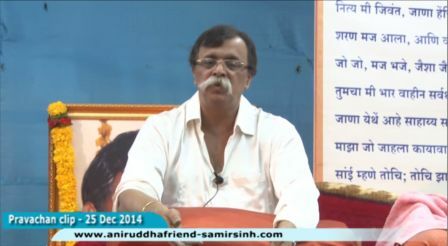 Our beloved Sadguru, Param Pujya Aniruddha Bapu visited Shri Guruji Rugnalaya managed by the institute, ‘Dr. 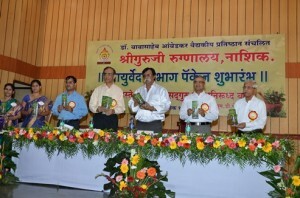 Babasaheb Ambedkar Vaidyakiya Pratishthan’. 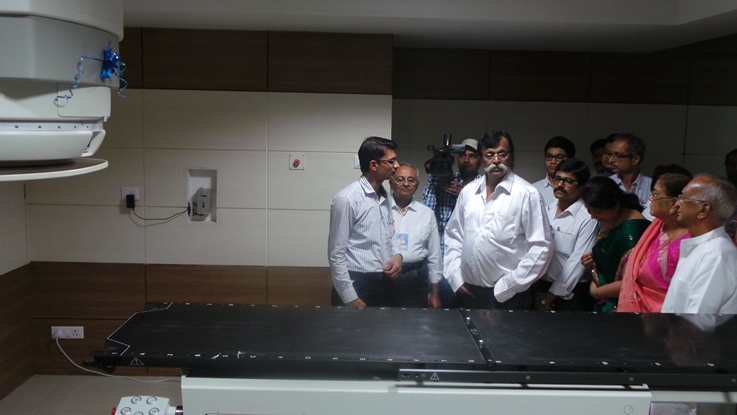 During this visit, Bapu visited the ICU, Dialysis Room, General Ward, Special Rooms, X-Ray, CT Scan, Pharmacy, OPD, Pathology, Cancer Radiation Room and other various sections of the hospital. After this, ‘Special Ayurvedic packages for a healthy lifestyle’ created by the hospital’s Ayurvedic Department, were inaugurated by Bapu at ‘Karmaveer Raosaheb Thorat Auditorium’. Some doctors at the hospital were also felicitated by Bapu during this event. After this, Bapu also insisted the hospital authorities to start a Homeopathic department. 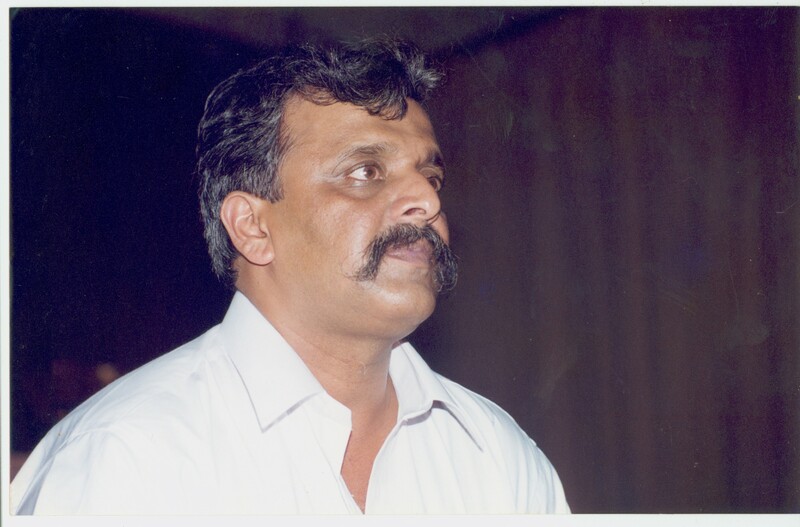 While saying this he said that as the third world war that has been brought upon us is going to deal with atomic weapons, an Allopathic or Ayurvedic method of treatment will not prove to be that effective. Homeopathic treatment which works at the energy level would only be effective at those times. 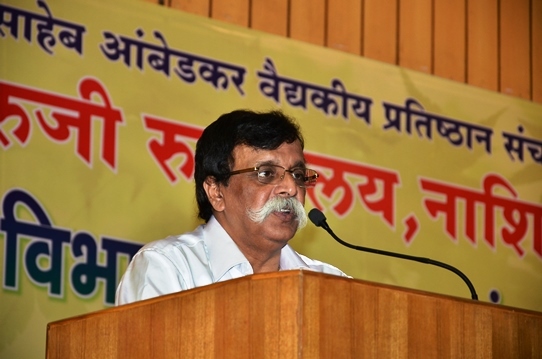 While speaking on this occasion, Shri Guruji Hospital’s President Dr. Vinayak Govilkar reviewed the hospital’s working procedure and gratefully mentioned that they are fortunate that being a social activity, they have received firm public support since the beginning. Similarly, during this occasion, Dr. Ashwini Chakurkar and Dr. Sonali Deshmukh gave the audience information regarding the special Ayurvedic packages. 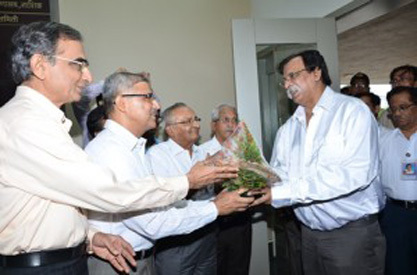 Dr. Girish Chakurkar made the introductory speech. At this time, the deputy speaker of Shri Guruji Rugnalaya, Shri Mukund Khadilkar, and Secretary Shri Pravin Burkule were also present. Shri Rameshbhai Mehta, who had an important role in organizing this event was also present on the occasion. After this, Bapu’s discourse was arranged in the KTHM College grounds. Here, thousands of shraddhavaans were eagerly waiting since a very long time to see and to listen to their beloved Sadguru. 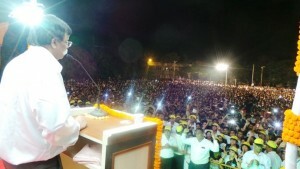 The events that Bapu covered at the auditorium were being directly broadcasted on the two big screens that were erected on the college ground. But the audience here was just waiting, waiting to see and waiting to listen to their beloved ‘Dad’ in person! After finishing the program in the auditorium, Bapu arrived at the college ground and the entire crowd erupted with joy. 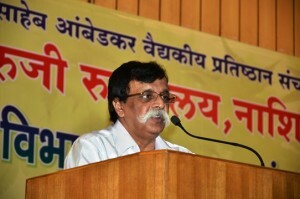 Bapu, while addressing the shraddhavaans during his discourse mentioned about the need for adjusting with the latest technology like mobiles, computer, tablets etc. if one has to survive in this ever-changing world. 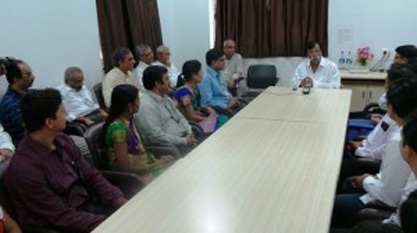 After Bapu’s pravachan, all the attending shraddhavaans insisted Bapu to come to Nashik again. After this program, the gajar, ‘Jayanti Mangala Kali Bhadrakali Kapalini, Durga Kshama Shiva Dhatri Swaha Swadha Namostute’, which is Bapu’s as well as all Sharaddhavaans’ favorite gajar, was taken and was passionately enjoyed by all. 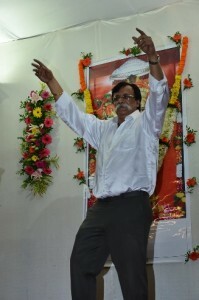 Bapu could not stop himself and even danced to the tune of this Mothi Aai’s gajar on stage for some time! 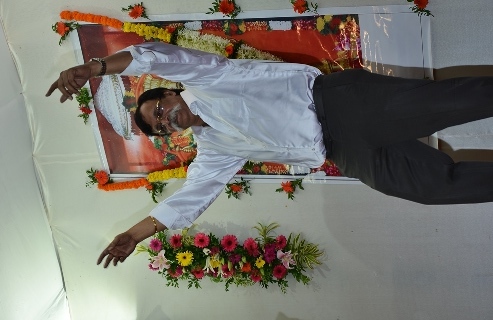 Later, on top of it all, Bapu took the mike in his hand and even recited the ‘Shree Guhyasuktam’ for some time. It was a very blissful and amazing experience for the attending audience. Just like all of the other functions of Bapu that have taken place until now, this one too was completely successful. I would like to specially mention here that all the shraddhavaans have a giant share in making this event successful. To give some background, this program was decided at the very last moment. To add to it, since the rainy season had already begun, sowing work had started everywhere in full swing in the rural areas. Then too, only because of the love for their Sadguru, shraddhavaans from not only Nashik but far off kendras too had come in large numbers to attend this program. I would like to mention one more thing that portrays the immense power of devotion (Bhakti). 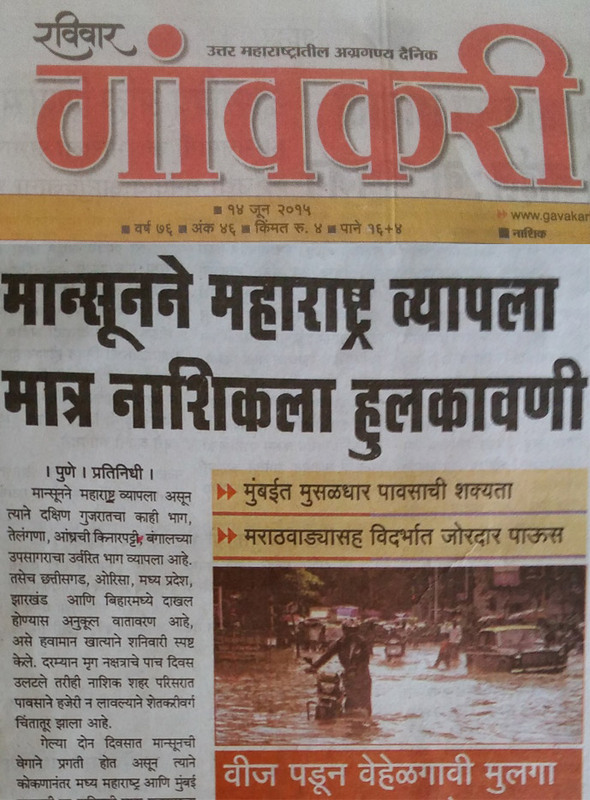 As we all know since the last week monsoon has become quite active in the whole of Maharashtra and we had come across the news of heavy rains pouring in various places. 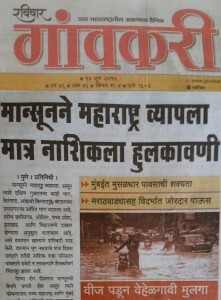 Since this Sunday’s Nashik program was to be held on an open ground, the worry that was concerning everyone was what if it rained at the venue on Sunday. Even though it was raining at a distance of a few km from the venue, not even a single drop of rain had fallen on the college ground until the end of the program! It was as if ‘someone’ had taken care of it!! …And to everyone’s surprise, after the event was over, a heavy downpour of rain began at the venue too on the very next day right from about 10 in the morning!! But this is the true power of prayers…the power of ‘Swastikkshemsauvad’, which was experienced by the people who attended this program. Due to the excuse of this occasion, we got to experience the truth that ‘Mothi Aai’ (Mahishasurmardini) can do anything for her Bapu’s shraddhavaan children. After experiencing the power of prayers and with the joyous experience of their Sadguru’s satsang in their hearts, the shraddhavaans returned home.